are sufficient in a customer’s bank account. It also transfers the funds from the customer’s account to the seller’s account, records the transaction and after the transaction is approved the terminal prints receipt for the customer. 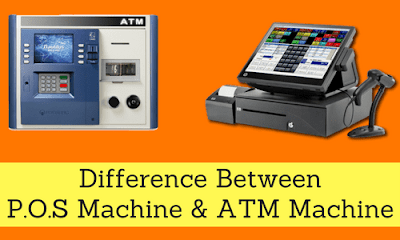 ATM stands for Automated Teller Machine. This computerizes machine permits customer to access their bank account with a magnetically encoded plastic card and a code number. It allows withdrawing money and making deposits, paying bills, obtaining bank statements, check account balance and transfer money. 1. The full form of P.O.S. is Point of sale. 1. Where the full form of ATM is Automated teller Machine. 2. P.O.S. is basically used at grocery or retail stores. 2. Where an ATM. is used at public places for the ease of banking service to people. 3. P.O.S. is used to give support to business for cash transaction. 3. Where an ATM. is used to give support to banking services. That’s why it is also called self-service banking machine. 4. P.O.S. is only used to transfer cash digitally from account to account. 4. Where an ATM. is used to transfer as well as withdrawal of cash. 5. A P.O.S. is run by a P.O.S. terminal, a server and a P.O.S. retail software. 5. Where an ATM. connects to a host computer through a network. 6. There is no restriction or no extra charge to use a P.O.S. at any number of time for a particular bank account in a given time. 6. Where there is a restriction or carrying extra charge to use a particular ATM. to use many numbers of time for a particular bank account to withdraw money in a given time.